Source: Produced in E. coli. Recombinant human PERK (aa 536-1116). Formulation: Liquid. In 50mM TRIS, pH 7.5, containing 100mM sodium chloride, 1mM dithiothreitol, and 20% glycerol. Handling: After reconstitution, prepare aliquots and store at -80°C Avoid freeze/thaw cycles. Scientific Background: The endoplasmic reticulum (ER)-resident protein kinase PERK (also known as Pek, or Eukaryotic initiation factor 2 α-subunit kinase 3 (EIF2AK3)) attenuates protein synthesis in response to ER stress through the phosphorylation of translation initiation factor eIF2α on serine 51. A Type I membrane protein located in the ER, PERK is a critical regulator of the unfolded protein response (UPR). Defects in PERK are the cause of Wolcott-Rallison syndrome (WRS). SDS-PAGE Analysis: Lane 1: MW marker; Lane 2: 1.0 μg of purified PERK protein (Prod. No. ADI-SPP-768). 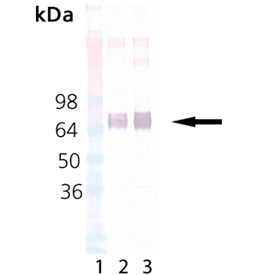 Western Blot analysis of PERK protein (Prod. No. ADI-SPP-768) probed with anti-PERK antibody. Lane 1: MW marker, Lane2: 50 ng, Lane 3: 100 ng. 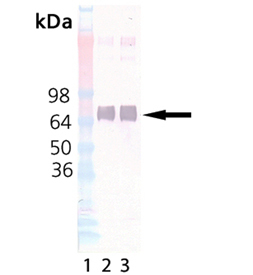 Western Blot analysis of PERK protein (Prod. No. 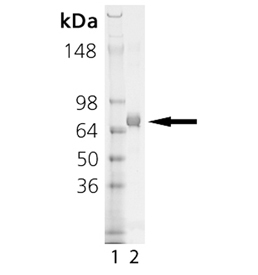 ADI-SPP-768) probed with anti-6x His tag antibody. Lane 1: MW marker, Lane2: 50 ng, Lane 3: 100 ng.